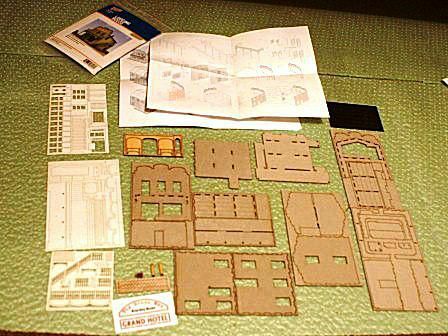 This kit includes hundreds of wood, paper and plastic parts. Lay out all the parts to familiarize yourself before getting started. ©2012 Ryan C Kunkle, licensed to About.com, Inc. In earlier days of the hobby, cardstock (paper), wood and metal kits were the norm. The proliferation of inexpensive plastic kits pushed these other models to the back for decades. The advent of laser-cutting has brought a rebirth of these kits. With precision cut parts, modelers get the best of both worlds - the guaranteed fit we've come to expect from plastic with the ease of working with wood and cardstock. Many beginners get started on plastic kits. Indeed they are still a hobby standard and the variety of buildings available is staggering. Plastic kits come in all sizes, prices and degrees of difficulty. The same is true of wood and paper models. One big advantage of wood and cardstock kits is the adhesives used to build them. Basic wood and white glue work fine. There are no harmful solvents and no worries about sticking your fingers together. You may also be surprised at how little glue is needed on these models, how quickly the glue sets, and how strong they can be once dry. Painting and weathering these model kits is also very easy. Some processes are even easier than with plastic. Customizing paper and wood models is also quite easy. The kit being built here will be done largely to instructions, but just like with plastic models you can "kitbash." The advantage with cardstock models is that the parts are much easier to cut and modify. The fist step with any kit is to familiarize yourself with all of the parts. Looking at the Walthers Hotel kit shown here, the necessity of this step becomes immediately obvious. Although the building materials are simple and the construction methods straight-forward, this is no simple snap-together kit. Several hundred parts await painting and assembly. Like many kits, there are several parts that look similar, but are not identical. Laser cut models like this are incredibly precise. Assemble per the instructions and no filing will be necessary. But only if you put the right pieces in the right places! Parts are not individually labeled. You have to refer to the instructions to match everything. Take your time and pay attention and there won't be any problems. And don't be intimidated by the number of pieces - assembly goes easily when you break it down into sub-assemblies. It is easier to paint the parts before trimming them from the sprues. Not only is it easier to hold the parts and faster, you won't loose or mix up pieces later. ©2012 Ryan C Kunkle, licensed to About.com, Inc. The steps involved in painting cardstock models are not much different from plastic or other materials. You can use acrylic or oil-based paints. Walthers also recommends artists markers, available at craft and hobby stores. I first tried using these on this kit, but found that the results were too glossy for the older, weathered look I wanted. Painting, or coloring, was easily however and for other projects the results may be just what you're looking for. Here are a few general tips that will help no matter what colors you choose, or what the kit is made of. Paint parts on sprues. The sprues to which the parts are attached not only help keep the parts in order, they make great handles. You can paint all of the parts, but especially the small parts, faster and with less fingerprints by keeping them attached. You may find some pieces, like the posts for the front porch, that need touch up painting after separating from the sprues. Even after the paint has dried, it is a good idea to keep the parts on the sprue until needed. Leave the bottle behind. It is easier to pour a small drop of paint on a piece of scrap plastic and work from that. Not only can you see how much paint you're getting, you can easily mix colors. A small brush or toothpicks work well for painting the small parts. A little goes a long way. Paper parts are much more porous than plastic. They will absorb the paint much faster. Too much paint can cause the parts to swell and warp. Working in thin coats, even drybrushing not only minimizes that problem, it also provides better control and the opportunity to create faded or peeling paint effects. Paint in layers. Applying a base coat of light gray to represent aged wood first will give a good base for painting the final color. The finished color can be applied more sparingly, or sanded off later, to reveal the natural "wood" underneath. You can simulate peeling siding by gently peeling up the lower edge of the clapboards with a hobby knife. A chisel blade also works well for this. ©2012 Ryan C Kunkle, licensed to About.com, Inc.
Like the smaller details, paint the walls of the building before being removing from the sprues. In addition to painting, a few additional weathering steps were taken prior to assembly. To create the look of old peeling wood siding, gently insert a hobby knife blade under the lower edge and push inward. A standard blade will work, but a chisel blade works even better, especially when doing this same technique with plastic walls. It is best to start on a back or less-visible spot until you get the hang of it. But the technique is easy to master. You can create as many or as few bowing boards as you'd like. For added effect, a few boards were "removed" entirely and replaced by new siding. Use a hobby knife to trim off and dig out a pocket. Do not go all the way through the wall. Insert a piece of balsa or bass strip wood to fill the void. I concentrated the repairs on one wall where a crew of painters will be busy putting a new coat of green paint on this old building. After painting the walls and allowing them to dry, some of the paint was removed by gently sanding with a fine sanding block. The pressed-paper walls already have a weathered gray look, so there was no need to prepaint an aged wood color underneath the finish coat. Working carefully, you can remove just a single layer of paint. Be careful not to destroy the walls themselves. Final weathering for the walls will come after the windows and doors have been added and the building is assembled. This will reduce chances of ruining the effects during handling. Windows are easier to assemble by working from the interior side. The upper and lower sash fit behind the window frame on the exterior. ©2012 Ryan C Kunkle, licensed to About.com, Inc. Assembly and installation of the many windows is one of the more time consuming parts of this building kit. Unlike many other kits where the windows are one or two pieces, each window in this kit has six. The instructions show windows being installed after the walls are assembled. I found it much easier to assemble and install all of the windows before attaching the walls. The doors are also shown installed during wall assembly. These should wait since you will need the floors attached to help get the proper positioning. Like many other kits, clear plastic is used to represent window glass. Walthers recommends either a clear parts cement (like that used for assembling model airplane canopies) or white glue. I found the clear parts cement, which I normally use on plastic-plastic windows, was far too runny and created problems bonding the plastic glass to the paper window frames. White glue worked beautifully. The trick to gluing all of the window parts using white glue is to use it very sparingly. For all of the assembly, put a drop of glue (white when working with windows, yellow "wood" glue for everything else) on a scrap of plastic. Then use an old hobby knife or a toothpick to transfer the glue onto the parts. If you can see the glue on the pieces you're joining, you've got too much. After the white glue dries, if you see any excess residue on the glass, it can be easily scraped off with a hobby knife. Build the upper and lower window panes as sub-assemblies first. Having these ready before you begin putting them together in the walls will save a lot of time. Begin installation by installing the small window sill in the base of the opening. Then place the frame around the outside of the window. It is easiest to turn the wall over and align this part from the back. An even overhang is necessary around the opening. Once these parts have dried, the upper and lower sashes can be installed from the back. Place the parts in the opening and then apply a small amount of glue to the seem from the interior side. The lower sash can be positioned open or closed. The process is tedious, but every part fits perfectly. The work isn't fast, but it is enjoyable. A magnetic board and small clamps are very useful when assembling the walls. ©2012 Ryan C Kunkle, licensed to About.com, Inc.
With everything painted and windows installed, it is finally time to start putting this building together. Like the smaller parts, everything in this kit fits perfectly. There is no need to force anything. If it doesn't look like it fits, you are probably installing it wrong. Follow the kit instructions of the order of assembly. All of the walls and floor pieces are designed to lock together with tabs and slots. Trim pieces will hide the seems later. Use wood glue to assemble the pieces. As with the windows, apply a very thin layer of glue with a knife or toothpick. Clamps and a magnetic assembly board can be very helpful in keeping everything aligned. These tools are most helpful for the first few walls before the kit developes more strength. Don't worry if you see a little warping in any of the walls. There are enough interior walls and braces in this kit to help pull everything into place. When finished, the structure is amazingly solid. Details from other kits and fashioned from cardstock scraps suffice for a basic interior. The walls for strengthening the kit also provided a natural block for lighting. Only lighted rooms have details. ©2012 Ryan C Kunkle, licensed to About.com, Inc.
As with the other buildings on the Rio Grande Narrow Gauge Layout, this hotel will receive interior lighting and even some basic details. One great advantage of this kit is the interior dividers used for strength. These also provide a perfect set of dividers to block interior lights. No provisions are included with the kit to add either lights or details, but the process is the same as with other buildings. Lights, figures and some furnishings came from the hobby shop. Others had to be built from scratch. The building is lit with three grain-of-rice bulbs from Model Power - one in the first floor front room and two in rooms on the second floor. I made two additional interior walls on the second floor using scraps from the sprues. To run the wires, drill a hole in the floors in the center of the building and notch the top of the divider walls slightly. LEDs would also be a good choice for lighting, since opening the kit to replace bulbs is not really an option. Given the limited use of this display layout, and a desire to get the job finished, I used what I had on hand. Since the 14 volt lights will be powered at around 10 volts, it should be years before I have to regret that decision! When creating interiors, the impression of detail is all you really need. The quality of the details is far less important than on the exterior. The first floor consists of a bar fashioned from scraps from the sprues. A few inexpensive figures and posters on the wall complete things. On the second floor, bedroom furniture was made from a Model Power yard sale set and cobbled together from more sprue scraps. Curtains in the many windows were cut from the paper sheet provided with the General Store kit. An open door provides a peek into a back room - another mini scene that will play out when the model is finished. You could easily go further with these details, but remember, You'll only see what you can see through the windows when its all done. With the interior in place it's time to put on a roof and finish the exterior detailing. The rolled tarpaper roof is easy to install using the scribed lines. Additional weathering like patches and exposed roofing adds age and detail to the most visible part of the model. ©2012 Ryan C Kunkle, licensed to About.com, Inc. This kit includes details to make a rolled tar paper roof. The techniques used here will work on other buildings as well. All you need is some black construction paper, a hobby knife, ruler and a pen. The Walthers kit includes pre-scribed lines to help space and position the roofing strips. If you are starting from scratch, it is a good idea to mark lines like this on the roof. Space them slightly closer together than the width of the strips. The color and texture of the paper is already spot on for the roofing, so no pre-painting was necessary. Strips are glued to the roof following the instructions, working from the bottom to the top. Wood glue works fine. For extra detail and a sense of age, make additional seems with a hobby knife. You can also peel up the edges of the paper, similar to the steps taken earlier with the siding. Model tar patches with a permanent marker or a small paint brush. For the final touch, I tore a section of the paper away, exposing the "wood" lathe roof underneath. This is simply the roof of the kit, scribed and weathered with powdered chalks. Chimneys included with the kit are nothing more than small wooden dowels. Drill a 1/8" hole in the roof and insert the dowels. Use a slow revolution with the drill to avoid destroying the roof, and be mindful of the interior walls. After weathering walls with chalks, figures were added to complete the scene and the story. ©2012 Ryan C Kunkle, licensed to About.com, Inc.
With all of the details in place, all the remains is to add some final touches to make the building more realistic. Begin by weathering the exterior. Dry powdered chalks make an excellent medium. Apply with a stiff brush to taste. Since this building is starting to get a face-lift, the remainder of the walls were weathered rather heavily. Figures placed around the exterior and interior of the building all help tell a story. On one side of the building a team of painters has begun applying a new coat of green paint to the walls. While the hotel's proprietor leans out a second floor window to watch their progress, on the other side of the building a man uses the distraction to sneak in the back door where a woman waits inside. Small details like this add a lot to the building and a layout.